CONGRATULATIONS!! Congratulations if you want to book driving lessons in Dublin. 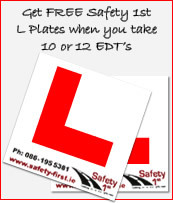 You have successfully clicked on Ireland’s finest and most informative driving school and driving lessons website, the road to becoming a safe and proficient driver starts here. My name is Ian Daly, since 1998 I have been a fully RSA approved driving instructor (A.D.I) offering value for money driving lessons in North Dublin to customers looking for high-quality one-to-one driver tuition. 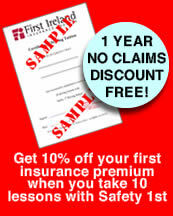 If you are looking for reliable Dublin driving schools with an excellent reputation and want to pass your test first time in Finglas or Raheny, look no further than SAFETY 1ST DRIVING SCHOOL. Our track record for first time passes is exceptional and we have been helping learner drivers successfully pass their driving test in Ireland for many years. CONGRATULATIONS to Tanya Chevel from Harmonstown who passed her driving test FIRST TIME in Raheny on 7/1/15 with 6 Grade 2 faults and 5 hours instruction. Well done Tanya! CONGRATULATIONS to Ciaran Pender from Beaumont who passed her driving test FIRST TIME in Raheny on 9/1/15 with 5 Grade 2 faults. He completed my 5 lessons pretest course including a pretest and demonstration drive. Well done Ciaran! CONGRATULATIONS to Conall O'Brien from Clontarf who passed his driving test FIRST TIME on 11/2/15 in Raheny with just 3 Grade 2 faults. He also completed my 5 hour pretest course including 1 pretest and demonstration drive. Well done Conall! CONGRATULATIONS Oscar Kwok from Swords who passed his driving test FIRST TIME in Finglas on 20/2/15. He did his 12 EDT programme with me and with lots of practice he sailed through his test with 4 Grade 2 faults. Well done Oscar! CONGRATULATIONS Martin Hayes from Tonlegee Road who passed his driving test FIRST TIME in Raheny on 10/03/15. He hired my driving school car and passed with 5 Grade 2 faults and just 4 hours tuition. Well done Martin! CONGRATULATIONS to Thiago from East Wall who passed his test on 25/03/15 in Raheny with 6 Grade 2 faults. He completed my 5 lessons pretest course to eliminate his bad habits and got him to test standard very quickly. Well done Thiago! CONGRATULATIONS to Marina from Balbriggan who passed her test FIRST TIME in Finglas on 01/07/15 with 8 Grade 2 faults. Marina hired my automatic driving school car and did her 12 EDT lessons with my school. Well done Marina! CONGRATULATIONS to Kim Cunningham from Griffith Avenue who passed her test FIRST TIME on 24/07/15 in Finglas with 5 Grade 2 faults. Kim hired my automatic driving school car and did a course of 10 lessons to get her ready. Well done Kim! CONGRATULATIONS Emma Conville from Howth Road who passed her driving test in Raheny on 15/07/15. She hired my manual driving school car and with in only 4 hours tuition she passed easily with 6 Grade faults. Well done Emma! CONGRATULATIONS Alannah Hughes from Whitehall who passed her driving test in Raheny on 01/09/15. Alannah never drove on her own but after 5 hours tution including a demonstration drive and 1 pretest was enough to get her through. Well done Alannah!